How do I use the Review Deconvolution screen? After peak picking, ions that are found to be different adduct forms of the same compound are grouped; this process is called deconvolution. 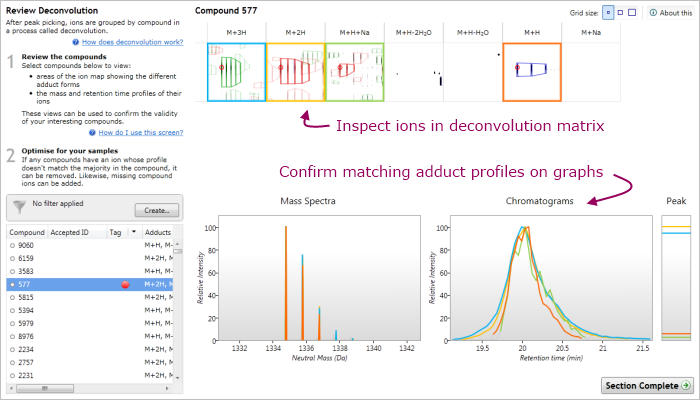 Once you've found the interesting compounds in your samples*, you may want to gain confidence in their validity by reviewing — and optionally editing — the deconvolution; this is where the Review Deconvolution screen can help. Typically, you'll use the deconvolution matrix first, looking for any obvious problems. If you're uncertain about the any ion, you then check to see whether the mass spectrum and chromatogram for that ion match the other ions in the compound. If you then decide that the compound needs an ion adding to it (or removing from it), simply right-click on the ion outline shown in the matrix to edit the grouping. How are the compound ions grouped into compounds? What does the grid in the top half of the screen show me? How can I use the mass profile and chromatogram to review deconvolution? How do I edit the set of ions from which a compound is formed? * Given that an experiment may have many thousands of compounds, it's likely that you'll want to do this for only the compounds of experimental interest.